The Katowice plant ... 69 Metropolis trainsets for the Riyadh Metro. France’s Alstom has started to deliver trainsets for the $23-billion Riyadh Metro, which is almost halfway complete. Work on the multi-billion-dollar Riyadh Metro is nearly halfway complete, and the first of the Alstom trainsets for the ambitious project have started to arrive in the Saudi capital. 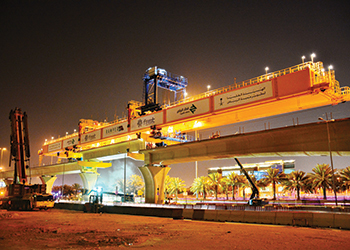 The metro is being developed by the Arriyadh Development Authority (ADA), the executive arm of the High Commission for the Development of Arriyadh, and is acknowledged as the world’s largest urban transport contract, involving the turnkey construction of a 176-km track network across greater Riyadh including 85 stations on six main lines. At a value of $23 billion, the metro is part of the integrated King Abdulaziz Project for Riyadh Public Transport and includes a parallel 24-line bus network for the city. Khalid Abdullah Alhazani, director of the architectural project programme and public affairs for the ADA, last month revealed that the metro project is nearly halfway complete. “We are on schedule on the Riyadh Metro and have reached 48 per completion and we believe operations will start by early 2019 with no delay,” Alhazani said during a press conference at Alstom’s plant in Poland. France’s Alstom, a world leader in integrated railway systems, had showcased the production of its state-of-the-art Metropolis train cars to be used on the metro at a special gathering at its Katowice plant in Poland last month. An international delegation travelled to south-west Poland, about an hour’s drive from Krakow, and included officials from the High Commission for the Development of Arriyadh and the ADA, journalists and senior Alstom officials to witness first-hand the production of the 36-m-long aluminium automated two-car trainsets. A mock-up of the Metropolis trainsets. 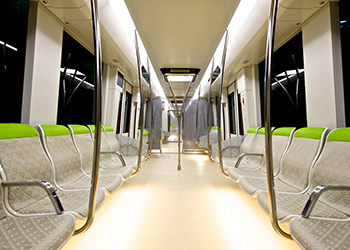 Each train offers a high level of comfort, ergonomic seating, LED lighting and advanced passenger information systems. The interior and exterior aesthetically design has been developed as per the ADA’s specific requirements including passengers with special needs. The exterior car bodies feature painted stripes that indicate the colour designation for each of the six lines the trainsets will run. All stations will be air-conditioned with high levels of comfort, safety, internet access, commercial areas with the use of solar power to reduce energy requirements and parking. The turnkey system involves complete system capabilities including signalling, electrification, track work and maintenance facilities. Alhazani said there are 190 trainsets to be manufactured for the metro with each to be fully tested prior to shipment to Saudi Arabia. These contracts involve the commissioning of driverless trainsets from three of the world’s largest manufacturers according to a unified design concept using the latest technologies: Siemens from Germany, Bombardier in Canada and Alstom. “The Riyadh Metro will contribute to the achievements of Saudi Arabia’s Vision 2030 through the promotion of metropolitan economic infrastructure qualifying the capital to be one of three Saudi cities planned to be ranked in the world’s top hundred cities as part of Vision 2030,” said Alhazani. 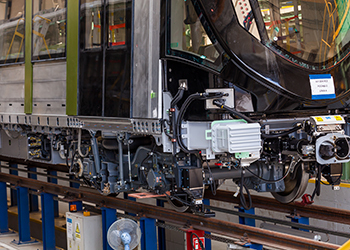 Alstom Transport is executing a contract to manufacture 69 Metropolis trainsets for the metro with each train providing three classes: first, family and single class, separated by glass partitions. Production was launched at Alstom Katowice in November 2015 and one trainset has already arrived in Saudi Arabia. A second was recently shipped from Hamburg and a third readied for transport as part of the agreed delivery programme. The Katowice plant ... work in full swing. The various production and manufacturing processes take place across several halls in Katowice in a seamless flow of application and expertise to meet the design parameters, technological requirements as well as safety aspects and testing of systems. There are four main elements in production from production of the aluminium car body shell with the sidewalls, end-walls, roof and underframe components welded manually, straightened, then machined and painted. Sub-groups pre-fit specific sections with manual assembly as well as the wiring connections, insulation and reflectometry. 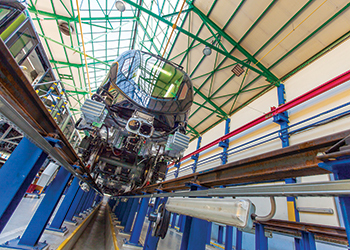 Further fitting involves the erection of the car body, bogies assembly, final fitting, static tests, water-tightness testing and the dynamic testing of the train cars. Each train is motorised, allowing the cars to run on gradients of up to six degrees and run on standard-gauge track at a top speed up to 90 km per hour. The trains are designed for the Riyadh climate with powerful air-conditioning systems capable of delivering sufficient cooling capacity. Additionally, all bogies, traction drives, brakes and doors are being fitted with special design elements to prevent the ingress of sand. 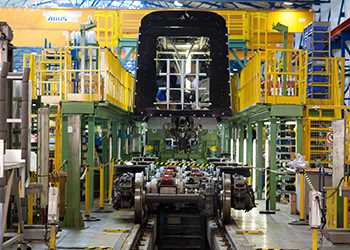 The Katowice plant is one of Alstom’s largest sites in the world and acknowledged as a global centre of excellence with all production for export and where the engineering, manufacturing and production takes place for aluminium, steel and stainless steel car body-shells. of manufacturing and production halls including welding, painting, assembly, testing as well as a dynamic test track. Katowice has a long 150-year tradition of railway and tram production with its first manufacturing hall in 1864 with Alstom having a presence in the city for 20 years since its acquisition in 1997. Alstom pioneered the introduction of high-speed trains across Poland and maintains a depot in Warsaw for maintenance of the fleet. Alstom is part of the FAST consortium of FFC (Fomento de Construcciones y Contratas Group), Samsung C&T, Freyssinet, Strukton Setec, Atkins and Typsa, which was awarded a $7.9-billion contract in 2013 for three lines – yellow, green and purple – involving the construction of 64.5 km of double track including 30 km of viaduct, 18.4 km of tunnels, 29 stations and two depots. Alstom is providing the Riyadh Metro with a fully integrated solution that combines maintenance support systems, an operational control centre and asset management systems which integrates all rolling stock, the 69 trainsets, the Urbalis signalling system for automatic train control and power supply and the Hesop energy recovery system. Work on the Riyadh Metro is well advanced. The Hesop system involves substations that reinforce the benefits of the motorised bogies with the recovery of braking energy with its reinjection into the metro’s electrical network optimising energy consumption and preventing the additional warming of the tunnels. These solutions aim to reduce engine wear and electrical breaking, thereby reducing maintenance. The project is also deploying Appitrack, the latest track laying technology. In June 2016, Alstom began construction on the tracks, the first to be installed on the project. Alstom has supplied its Metropolis trainsets to Hungary and the Netherlands, and will provide 50 trainsets for Dubai for its Expo 2020 requirements. Metro systems have long been the key to success of the world’s major cities providing fast, cost-effective, reliable and environmentally friendly travel solutions. From the first metro in London in the 1860s to today, there are about 190 cities with metros. Riyadh’s metro system will serve most neighbourhoods in the Greater Riyadh area, government offices, schools, businesses and main healthcare facilities. It will also provide a vital link to King Khalid International Airport, the King Abdullah Financial District (KAFD), the downtown area, major universities and other branches of the public transit system. Work on the Riyadh Metro is well advanced on both the metro and parallel bus network. Eventually, the entire network will be able to handle up to 1.6 million passengers per day and increase later to 3.6 million and will profoundly change the way Riyadh’s inhabitants and visitors move around the city. Currently, greater Riyadh has a population of 6.5 million and this is expected to reach 8.3 million by 2030.